The most unique aspect to Think Pacific is that every team visits a different location and supports different schools. This creates a phenomenal experience for our volunteers. You are often the first ever volunteers your community has hosted. This brings a unique buzz of excitement- it develops your personal connection to the village and unique memories for everyone. Most Importantly, this model allows our charity to have a wider and more sustainable impact. 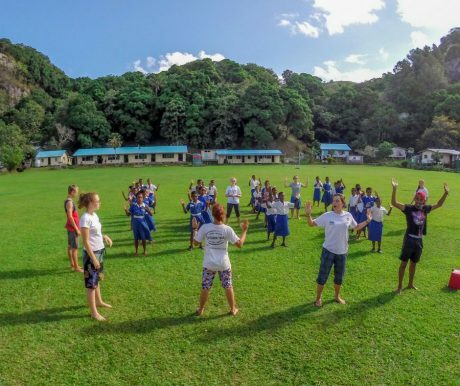 Rather than focusing upon just one school or one location in Fiji, it means we can inspire thousands of children annually, provide wide spread messages of education, sport and health and upskill community members to continue programmes locally. 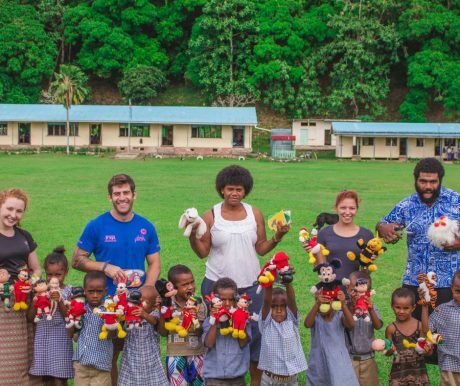 It is a model, which has been handcrafted by our charity with The Fijian government. A model which is achieving remarkable results! 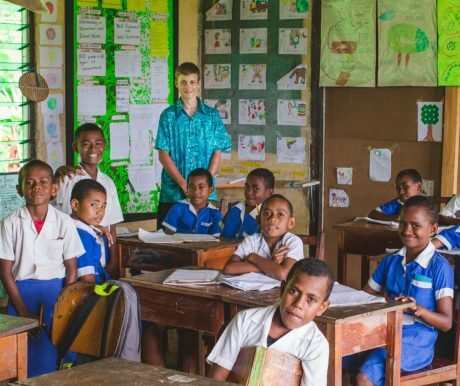 Following their own needs assessment, the Provincial Councils in Fiji must submit school statistics and community locations to the Fijian government in order to make a formal request for a Think Pacific Youth and Sports Volunteer Project. At any one time we may have numerous Provincial Councils making requests with 100’s schools across Fiji asking to receive a volunteer team. We can only visit about 40 schools per year. Some schools wait many months, even years, for our project to take place. So don’t be surprised by how excited everyone is to see you! 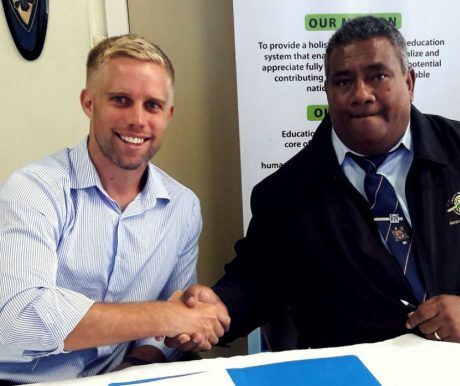 Think Pacific is in partnership with The Fijian Ministry of Education, The Fijian Ministry of Youth and Sports, The Fijian Ministry of Health, The Fiji Sports Council and The Fiji National Sports Commission. A committee in Fiji meets to discuss and prioritse the requests from schools, and highlight the locations, which have the biggest needs and where we can make the most appropriate difference. This process is critical as it ensures Think Pacific projects are planned and prioritised locally, based on real need, through direct involvement at Ministry level. Our Youth and Sports Officers visit the schools and run planning days with the teaching staff. We run through the core aims and lead introductory sports sessions, kindergarten classes and youth workshops so we can learn about the school and assess their biggest needs and what resources the teachers may have. We work with teachers to highlight children that would benefit most from one-to-one support, we plan the sports rota and the house cup programme. The excitement for the project builds as we explain the project in detail to families and kids and everyone prepares to meet you. 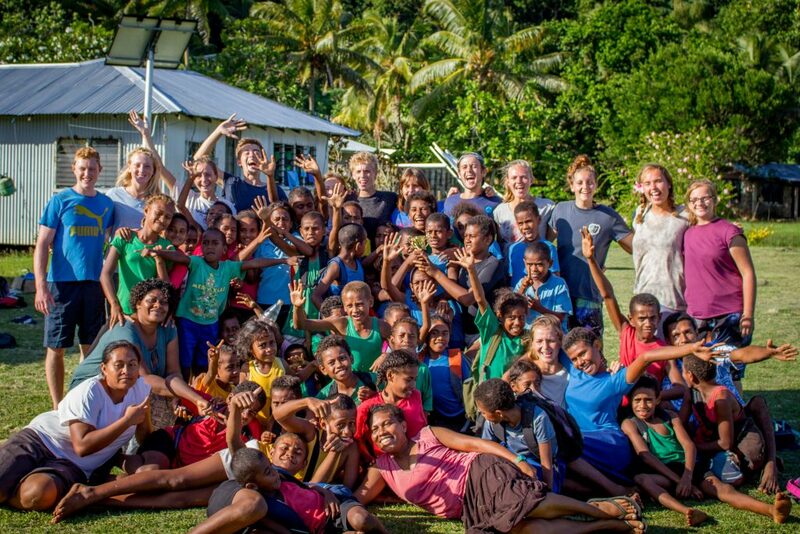 We’re incredibly proud that we have developed a project, which is so intricate, so locally led, and so beneficial for Fiji. As every project visits different schools, the logistics for each project necessitate a be-spoke approach. We could be in the heart of the jungle or on an outer island. Every location brings new challenges and experiences. We may need to arrange transport by motor boat or organise how to cross rivers or hike the most convenient trails to a remote kindergarten each day! We’ll also plan sports outreach days to even more rural schools. We will likely need to organise bus transportation on specific routes deep into the jungle. We use a range of suppliers to ensure we have safe and reliable transport. We complete risk assessments for all expeditions, plan communication and nearest access to medical care so that each project is safe and perfectly prepared. We buy specific resources for each school we work with, which your team shall use and donate to the children – from stationary materials to kindergarten resources and sports equipment. We also buy (within reason) any specific items the school or you may have requested. If you want to lead specific lessons – be this recorder lessons or coach lacrosse as examples, do let us know as we’ll try and source the kit ready for when you arrive so you can make a personal impact based on your interests or skills. Some projects take months to plan. And when you arrive, we’re at the culmination of so much effort which means we can’t wait to begin! 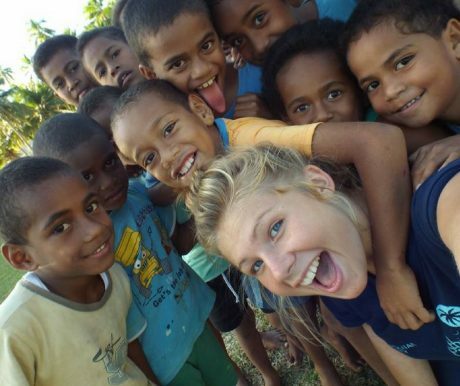 From the moment you land in Fiji, you are part of something very special. We’ll brief you at a beach resort, the government will present to you and our Youth and Sports Officers shall explain the needs of the school and provide training in basic education, youth and sports coaching. Each project is guided by our team of expedition leaders who are with you 24/7. They’ll guide you into the community. 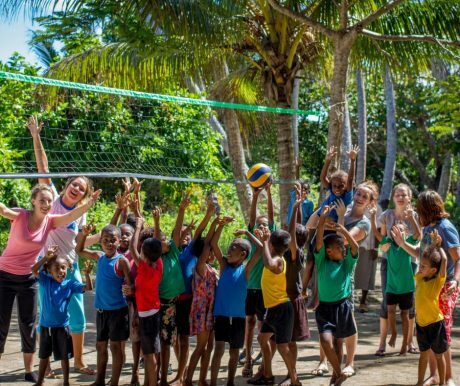 You’ll become a part of the village and each day we’ll deliver the programme with the local schools and teachers. The actual volunteering is simple, yet massively beneficial. From running kindergarten classes, to one-to-one tuition with children, to extra-curricular activities to sports coaching. Every project is reviewed in depth, this includes getting feedback from you, our volunteer team as well as the teachers and members of the community. Through critical assessment we look at what areas worked best and what areas can be improved, so we can ensure the schools see the maximum positive benefit whilst our volunteers gain a unique experience. 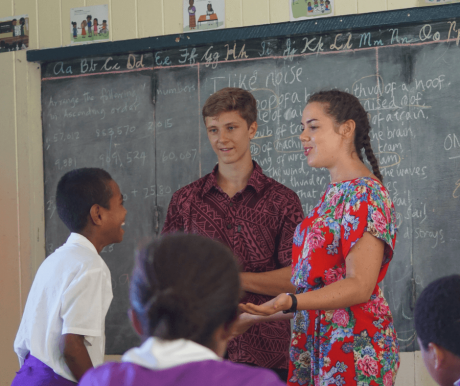 Our programmes are also assessed by Fijian government departments, universities and regularly visited by The British High Commission. A crucial aim of our assessments is to see how we can support the school long term and where we have the greatest potential for local empowerment and sustainability. Educate the Educators is a training programme, which our Youth and Sports officers design and implement for teachers and local community members. The aim is to upskill local people specifically in sports related skills so we can ensure the continuation of PE lessons, development of children’s health activities and grass roots growth of children’s sports teams. In addition we provide training in Early Years Education techniques for local community members and teach teachers how to continue our ‘House Cup’ programme. Through this model we train over 50 teachers a year, empower local communities to lead their own sports, youth and kindergarten initiatives and ensure development contrinues locally. Our long-term aim is for the schools we support to develop themselves. To have locally managed kindergarten schools delivering effective early years education, primary schools which run diverse programmes of educational and extra-curricular activities themselves, health advocacy to be promoted locally and established sports teams (with associated leagues and competitions) for children to excel. You volunteer for a short period of time, but with Think Pacific your impact is part of a long-term plan, which is backed up by our charity. 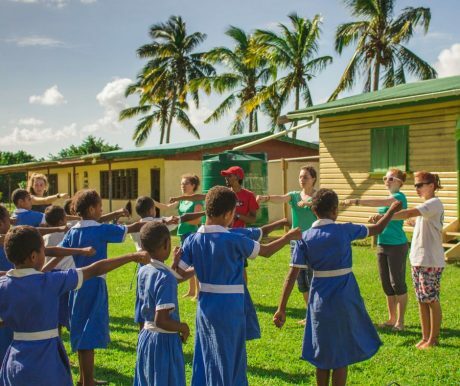 We’re enabling children in the remotest areas of Fiji to have an improved education, more opportunities and the confidence and aspiration to achieve their goals. This is what our charity is for. It’s a long process, but every volunteer and every project contributes significantly. 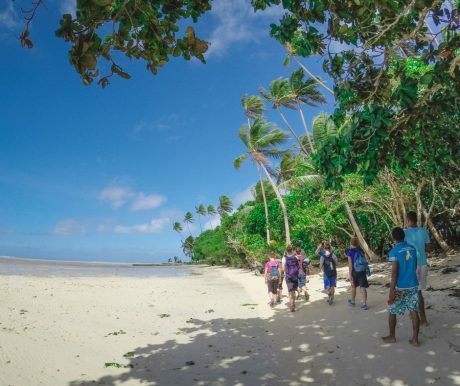 Curious to Learn More About Our Expeditions in Fiji?